As the third season settles into its second half (and, incidentally, the new year), So Weird begins to resemble itself again after a long period of readjusting to a new status quo. “Grave Mistake” and “Pen Pal” aren’t exactly high on the list of quality episodes, but both demonstrate a remarkable flexibility on the part of the show in incorporating Annie’s character arc as an outsider with the show’s usual mix of fantasy/sci-fi storytelling. “Pen Pal” is the more interesting of the two, for its flaws as well as its strengths. 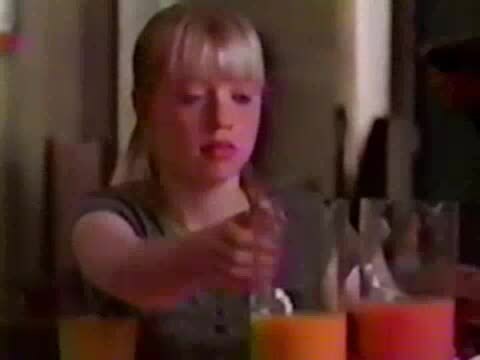 The biggest flaw is that, in the show’s rush to do a “parallel universes” episode, it moves remarkably quickly to establish human life as an endless series of binary decisions, reflected in the teaser as Annie making a choice between two juices for breakfast. It would be more realistic for someone running late for school to just skip breakfast and have a large lunch or dinner instead, and by allowing for a multiplicity of options instead of just the two, “Pen Pal” could have gone for a much bigger idea (an infinite number of Annies each based on the different possible decisions Annie could have made over the course of her life) for approximately the same budget. Fortunately, this doesn’t hurt the episode too much, as staying small allows the show to explore a completely different side of Annie. The episode builds slowly to the reveal of “punk-rock Annie” (hereafter referred to as Dannie, for Dark Annie) through a series of postcards and letters Dannie sends to the Hope Springs household, combined with a less-than-glowing report card for Dannie. These throw everybody for a loop, particularly Annie, who is fairly certain she did not run off to Washington, D.C., with a new lady-friend named Jennifer and is more than certain that her grades are up to her usual perfectionist snuff. Things get even crazier when Dannie finally shows up with Jennifer while Annie questions Fi about the nature of parallel universes and what happens if and when they collide with each other. Jennifer turns out to be the source of the decision that inadvertently caused Dannie to emerge. Rhonda and Chelsea (Annie’s friends from the high school episode trifecta that kicks off her run on the show) explain to Annie how she very nearly missed out on hanging out with Jennifer, which leads Annie to correctly guess that Dannie is herself, reflecting the alternate decision of hanging out with Jennifer. Jennifer is largely a plot device, but it reveals a more lax, carefree persona, one that externalizes the alienation Annie feels. Unfortunately for Dannie, that externalization comes at a cost. At the climactic showdown in Annie’s room, she mocks Annie: “Are you gonna get your panther to come protect you? Well don’t forget, I’ve got one too!” She turns out to be wrong; in exchange for not coming to terms with her own feelings, Dannie’s panther has abandoned her, which is why Annie ultimately wins out, re-stabilizing the universe and dooming the parallel universe to a quick death. Afterwards, Annie tries to reassure Molly that she’s “never been happier,” but the truth is that, panther aside, Dannie was right about one thing: “It’s like looking in a mirror.” It’s not dissimilar to the (admittedly more nuanced) Buffy-Faith dynamic from Buffy the Vampire Slayer, because despite differences in upbringing or choices made differently, those two are also essentially two sides of the same coin. So it is with Annie and Dannie. Nonetheless, “Grave Mistake” does tap into two key aspects of Annie that the show has started to sharpen in recent episodes. First, and most immediately, the episode establishes that Annie, despite becoming a believer of the paranormal, is not Fi, with her finely-tuned senses and deep drive to explore the unusual. Margaret bursts into the Phillips household looking for Fi and is outwardly disappointed to find out that she’s not there. This puts Annie in her less exciting “passive” mode, but it re-emphasizes the way Annie is still an outcast, and here is almost outright ostracized for the sin of not being the daughter of Molly Phillips (though Margaret is too kind to do that to her on purpose). Second, the episode ends with Annie keeping another secret from the rest of the family instead of doing as Fi would do and dragging them into her world of the weird and supernatural. This follows from the previous episode, “Still Life,” in which Annie hides the true nature of the “camping trip” the family took. It’s a small but powerful way to keep Annie from being too much of a bland Fi replacement by emphasizing how much she desires her own personal head-space. Neither “Grave Mistake” nor “Pen Pal” add much to the overall oeuvre of So Weird. But both episodes stand well enough on their own, flaws and all. “Pen Pal” opts for a simpler version of its grand idea in order to get at a deeper truth about Annie; “Grave Mistake” plays too close to the genre vest but doesn’t sacrifice structure or quality for surprise or cheap tricks. It’s not always fun to spin the wheels of a show just when it has started to solve some systemic problems within its current season, but for 26 episodes (building up to Disney’s magical number 65), it’s a must, and in the history of So Weird, it has more hits in this category than misses. Cameron White is a freelance writer currently residing in Arkansas. He writes about television over on his blog, Wayward Television, and tweets about the beat, which has just been dropped. His obsession with television was founded in 1996 by The Disney Channel and fostered by his discovery of Firefly in the summer of 2007. Pencils tremble at his feet… during earthquakes.